Dia De Los Muertos (translation: Day of the Dead) is a Mexican multi-day holiday (October 31st – November 2nd) where deceased family members are remembered and celebrated, and prayers are made for their spiritual journey. It is also both the inspiration and the name of Endorphina’s 25th October 2018 slot release of the same name. 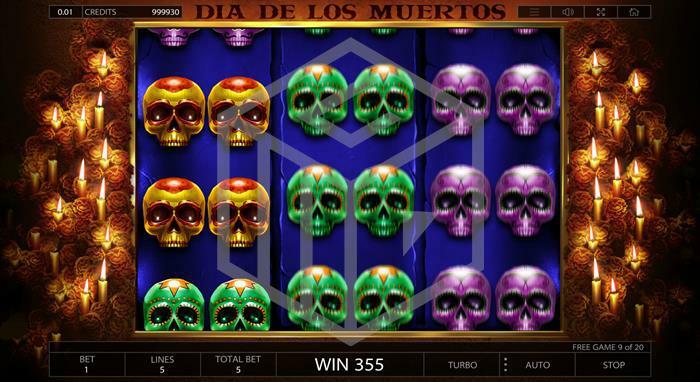 Dia De Los Muertos is a 3x3 reel, 5 pay line, medium variance slot with an RTP of 96%. The game benefits from a gamble feature and a potential lucrative free spin round. Spins cost from just €0.01 up to €50 a time. 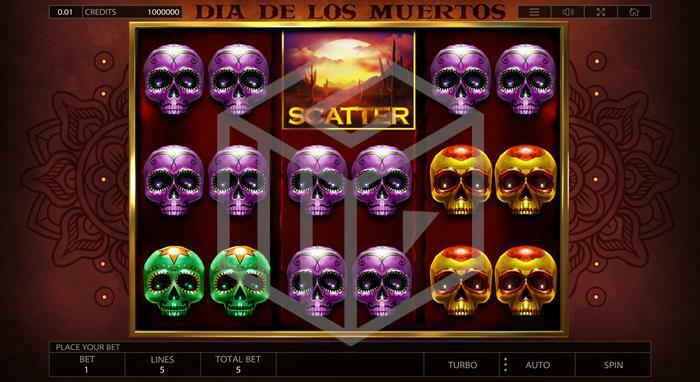 Dia De Los Muertos is a nicely designed slot completely in keeping with the theme of Day of the Dead. The soundtrack is also suitably haunting; a single Spanish guitar playing a sombre refrain interspersed with some dull thudding drums in the distance and the occasional chime from a churchyard bell. The symbols include some impressively detailed skulls (sugar skulls are often used to decorate departed relative’s shrines and graves during the celebrations), a superbly drawn image of La Catrina (a female skeletal icon of Dia De Los Muertos), another of a male skeletal figure in a sombrero, and a scatter symbol showing an arid Mexican landscape at sunset. The purple, red, green and golden skulls are the lower value symbols with the male figure and Catrina the highest value. Three Catrina’s in a row pay 100x the bet size (based on playing all 5 lines) but this goes all the way down to just 1x bet size for 3 purple skulls. 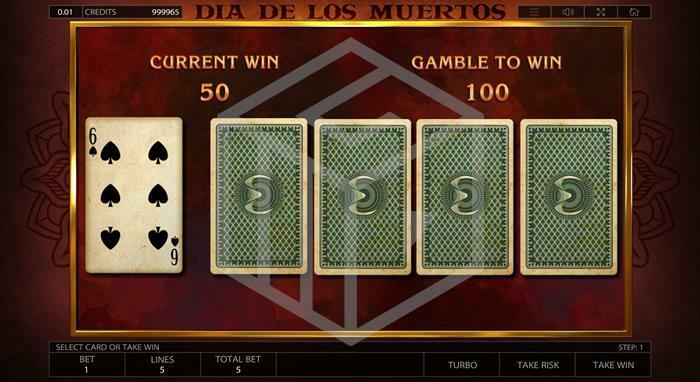 Dia De Los Muertos offers a gamble feature and also a free spin round. A feature common to Endorphina games, the gamble option allows you to risk a win via the turn of a card. If your card is higher than the card you see being dealt to the dealer then you double your money. This continues until you either take the win, or you lose the gamble. The dealer’s card will change after each gamble. Land 3 scatter symbols and you’re awarded a healthy 20 free spins. During the free spin round, La Catrina doubles as a wild, increasing your chances to win considerably. Furthermore, if you land three scatters during any single spin during the free spin round another 20 spins will be added to your round. There are some nice visual touches during the free spin round as the area surrounding the game board fills with animated flowers and candles. When I first looked at Dia De Los Muertos I was impressed with the design, and Day of the Dead is always a popular theme so I was eager to get spinning on what appeared to be a 6x3 reel slot. I was, however, pretty disappointed to find that in fact each skull symbol had two skulls per reel and it was, in fact, a 3x3 slot with just 5 pay lines. I know some players enjoy the classic 3x3 set up so I would usually cut the game a little slack here but the fact that there are only 6 paying symbols (plus the scatter), two of which (the male and La Catrina) are considerably harder to land than the skulls means that smallish skull wins are coming in left, right, and centre. The least I’d expect from a 3x3 slot with minimal pay lines is a high volatility game with some big pay line wins but playing Dia De Los Muertos I landed a full board of identical symbols so often that it offered zero excitement at all. Usually, if you land a full board of anything you’re looking at a hefty pay day­s, so that was disappointing. That said the free spin round was not bad at all. The wilds add more significant wins and the few times I got into the feature the spins tended to retrigger fairly regularly and I made several big scores. Overall, however, Dia De Los Muertos didn’t really live up to the expectations set at first glance and is a pretty pedestrian game, albeit with an OK free spins round and a pretty design.